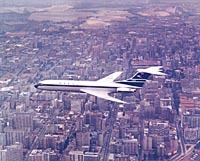 21 December 1962 First flight. 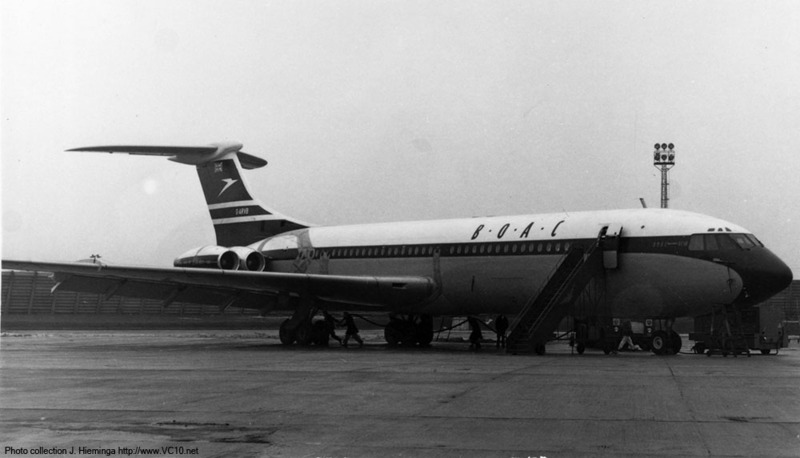 16 January 1963 Registered as G-ARVB to BOAC. 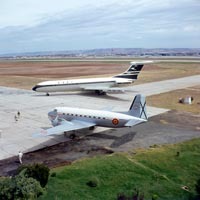 12 August 1963 Flown to Torrejon, Spain for four weeks of tropical trials. 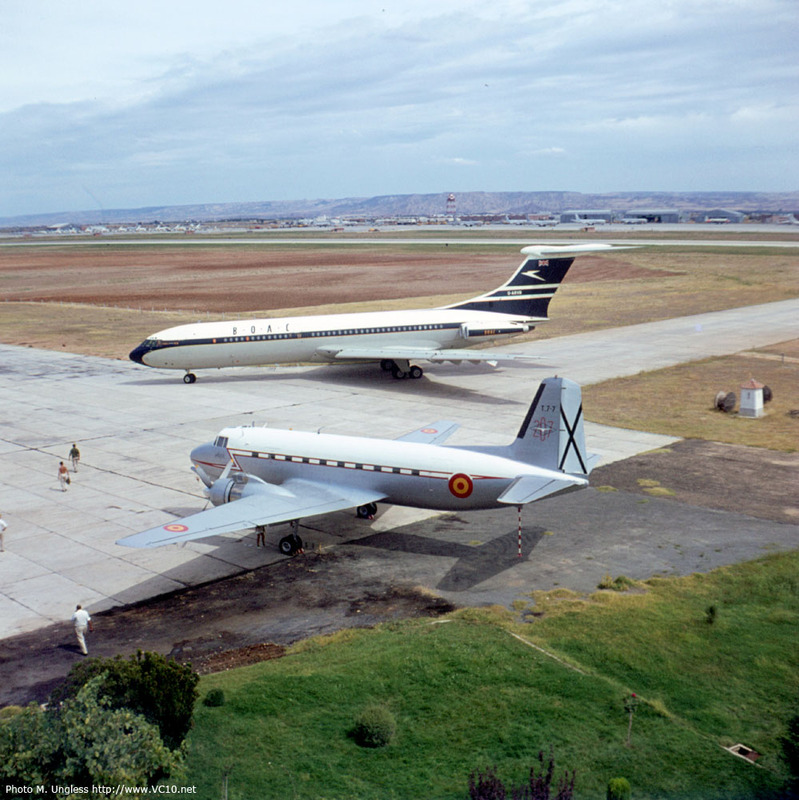 14 September 1963 Returned to Wisley from Torrejon. 21 October 1963 Flown to Cairo, and on to Johannesburg, South Africa the next day for more tropical trials. 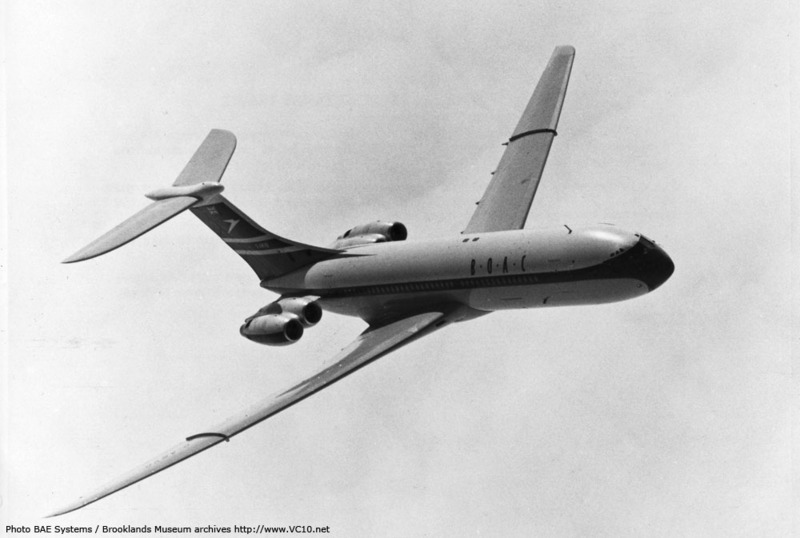 First equator crossing for a VC10 (along with several other firsts)! Returned in November 1963. 8 April 1964 Went to Marshall of Cambridge for refurbishment to production standard. 2 February 1968 Loses radome and sustains damage from ice encounter, lands escorted by Hawker Hunter. 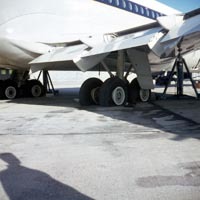 1974 Taken out of service and stored at Heathrow, according to Boeing the airframe had also been cannibalised by the time it was scrapped. 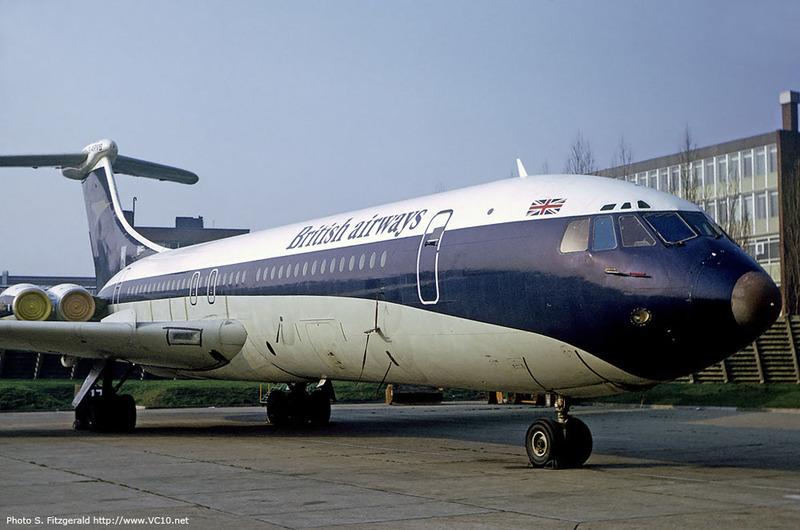 September 1976 Scrapped at Heathrow, together with 'VE and 'VH. 7 October 1976 De-registered and transfered to 'unqualified owner', actually Boeing, in part exchange for 747s. 1. 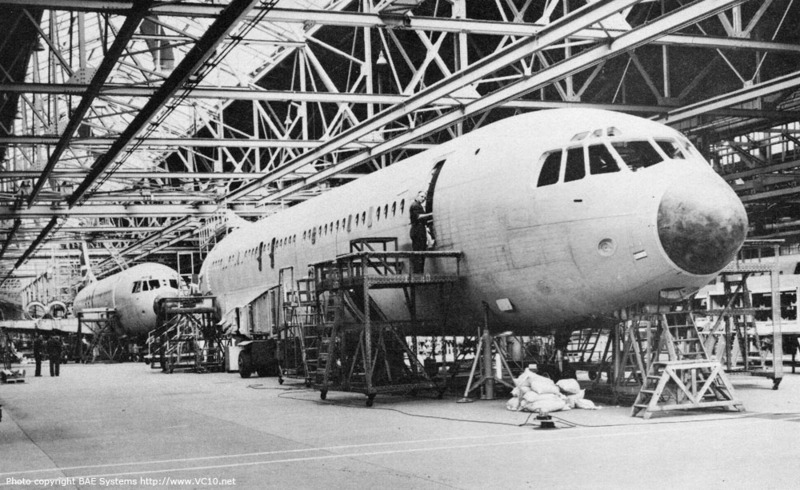 The fuselage of G-ARVB is seen here on the assembly line at the Weybridge factory with G-ARVA in the background looking more complete. 2. G-ARVB hooked up to ground equipment for testing at the Weybridge factory site. 3. 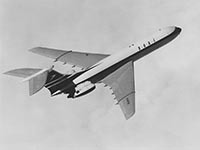 A promotional shot of G-ARVB taken early in the flight testing programme, this aircraft was allocated to take off and landing performance testing. 4. Another photo from the same flight on 21st September 1963 showing the clean lines of the original tpe 1101 wing without the large inboard fences. 1. G-ARVB parked at Heathrow during the testing program. 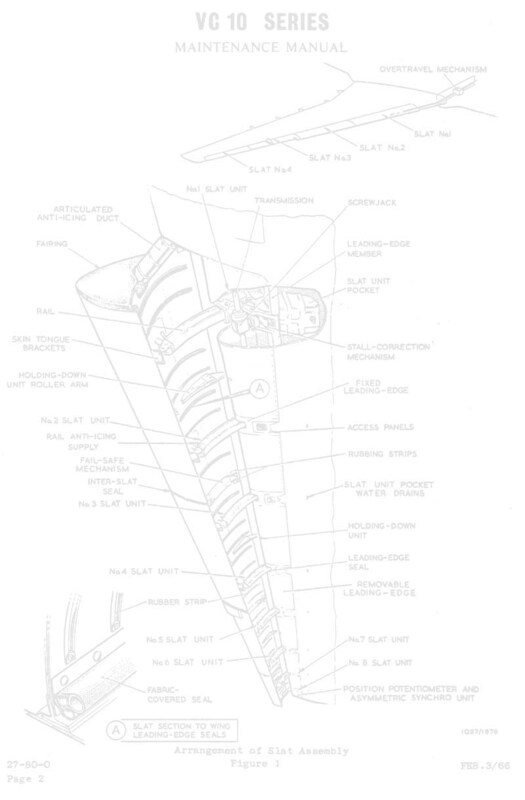 The markings on the fuselage side show where pressure tubing was routed for aerodynamic measurements. 2. Taxi in at Torrejon, Spain, after Accelerated Stop (Rejected Take-Off) trial. In the far background is a line of USA Strategic Air Command Boeing B47s, of the NATO Nuclear Bomber Force. 3. 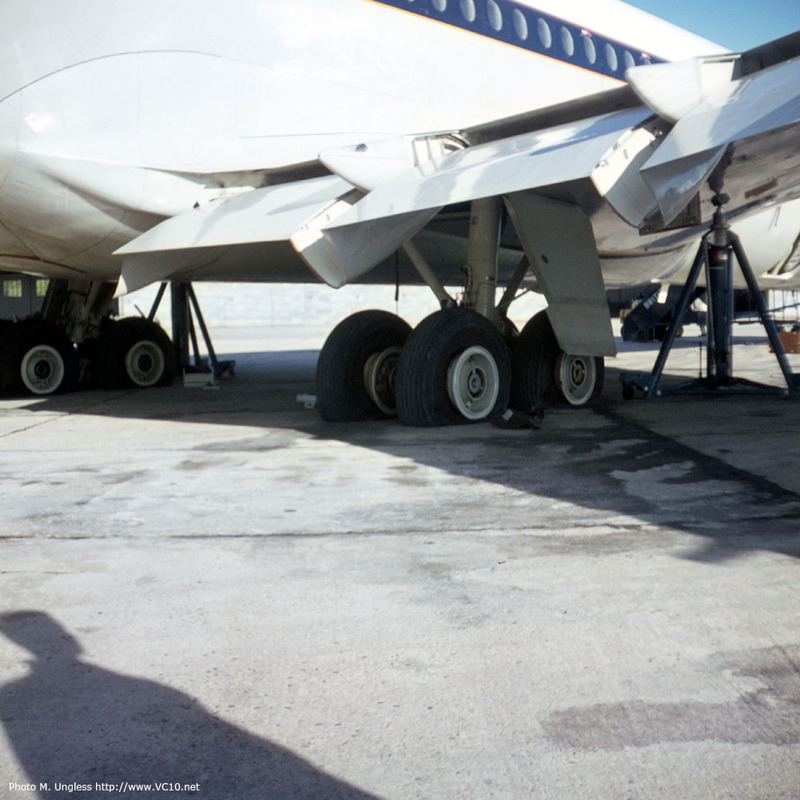 'VB parked on the apron after the maximum kinetic energy test. Because of the heat build-up in the brakes the tyres have deflated. 4. 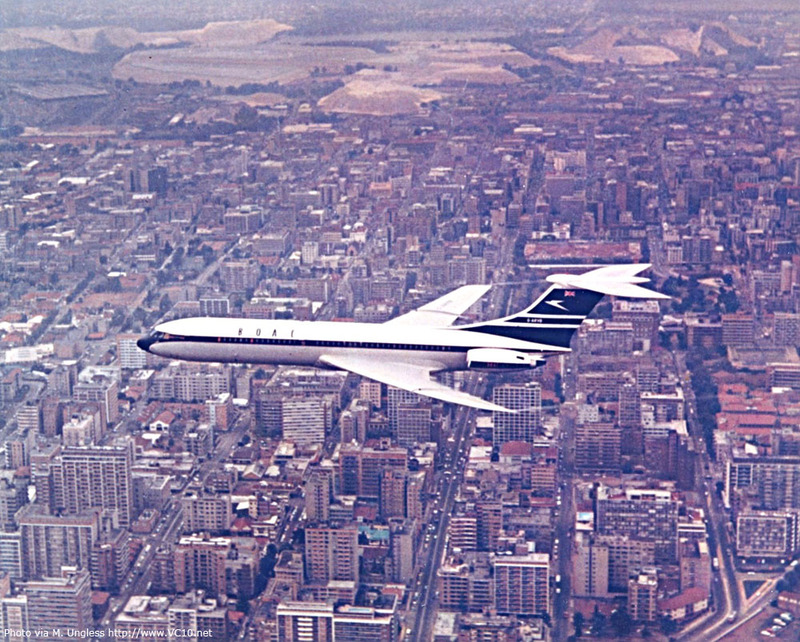 Standard VC10 G-ARVB on Tropical Trials, October 1963, overflying city of Johannesburg South Africa with captain Bill Cairns at the controls. 1. G-ARVB in the first Golden Speedbird livery, awaiting new passengers. 2. G-ARVB landing after the ice encounter, the missing radome is obvious with the weather radar exposed. 3. G-ARVB stored at Heathrow's maintenance base. 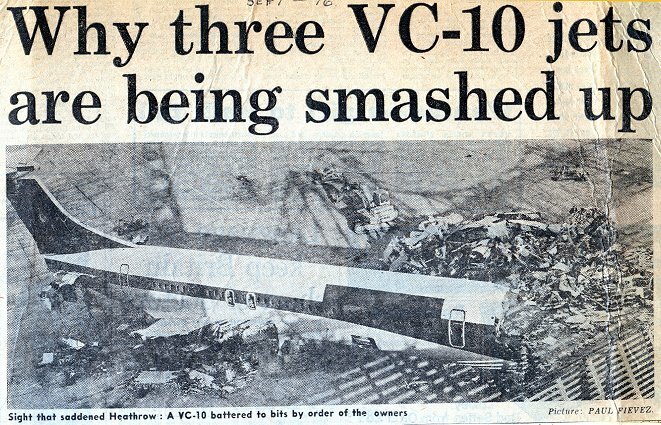 Together with 'VE and 'VH these VC10s would be scrapped were they stood in 1976. 4. 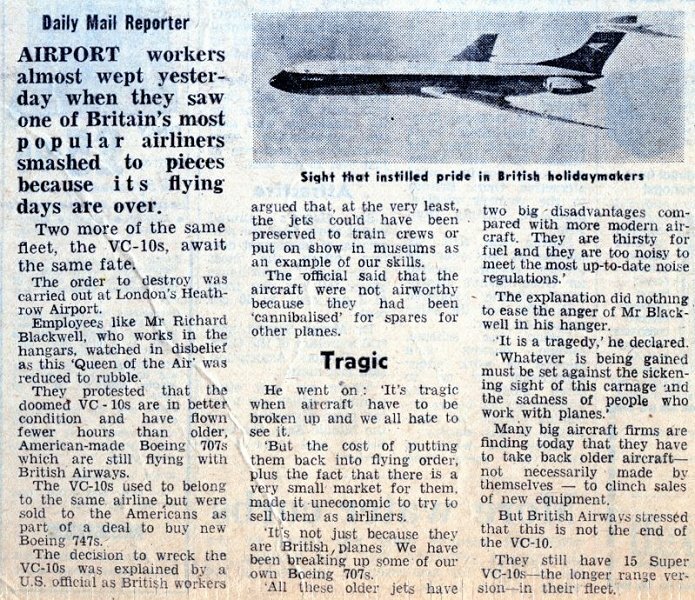 The Daily Mail ran this article about the scrappings at Heathrow in September 1976. 1. 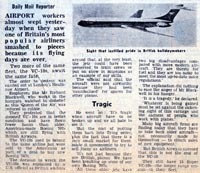 The Daily Mail ran this article about the scrappings at Heathrow in September 1976. 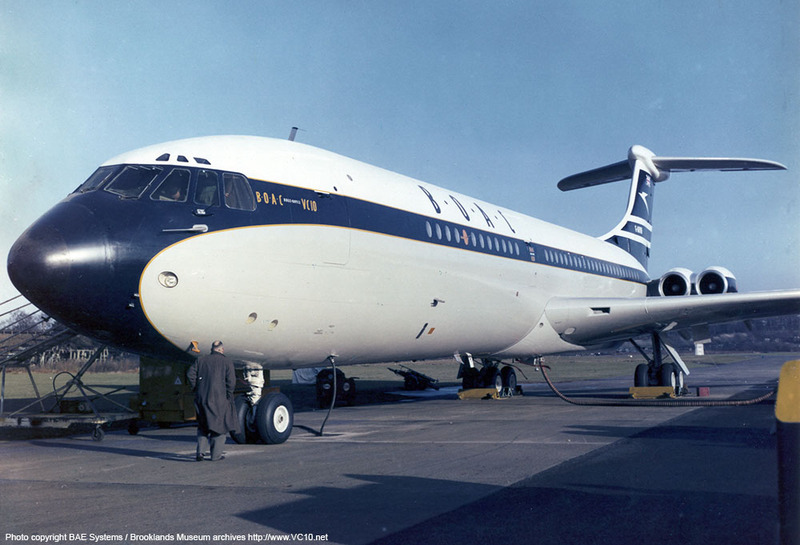 Vickers /BOAC BOAC scheme of white over grey fuselage, dark-blue cheatline and fin with two white bands over fin. 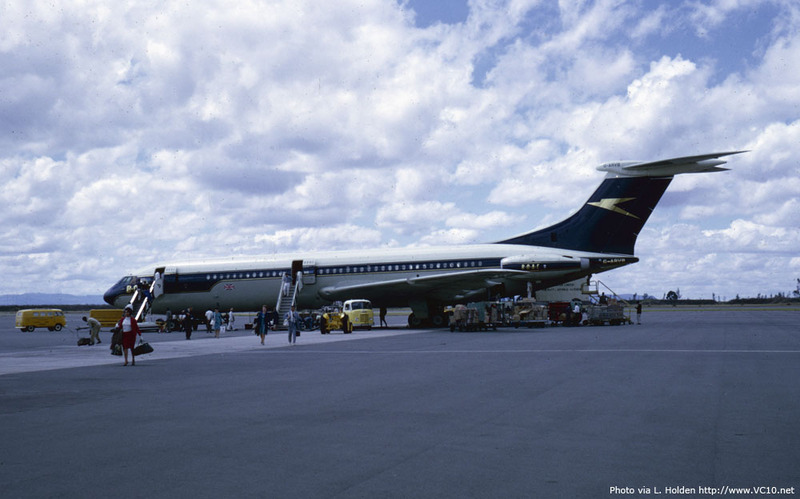 BOAC First version of BOAC 'Golden Speedbird' scheme with stepped, gold-edged dark-blue cheatline. Grey lower fuselage and white upper fuselage. Dark-blue fin with gold speedbird logo. BOAC Second version of BOAC 'Golden Speedbird' scheme, golden edge on cheatline removed and cheatline now arcs smoothly down towards the nose without the step of the previous scheme. 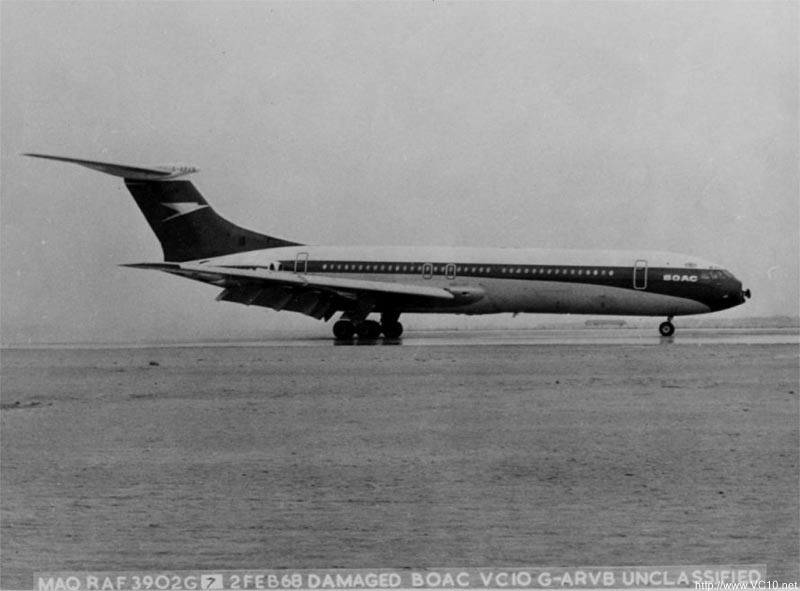 BA Scheme as last BOAC version above but with 'British Airways' titles on front fuselage.